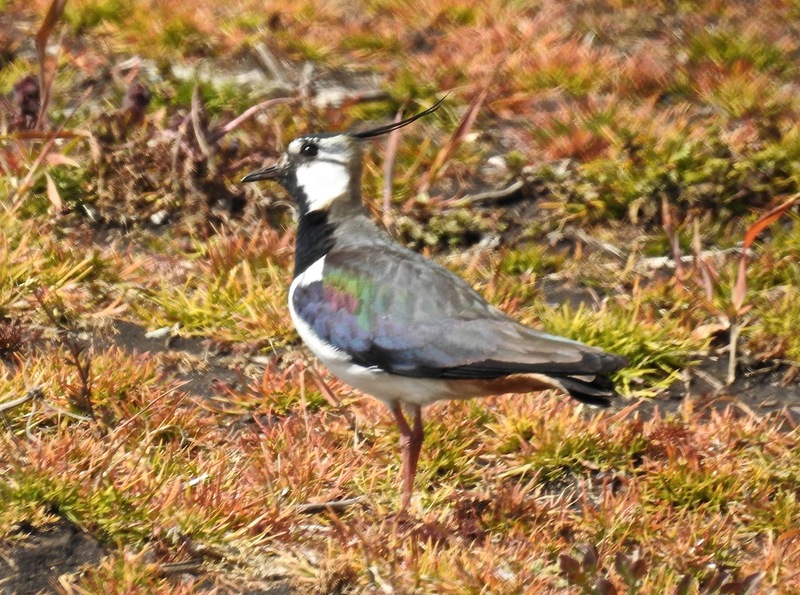 You know you’ve been too long on the mosses when you begin to suspect the Lapwings of using make-up, but it’s always fun to watch ’em tumbling and wailing over the fields. A few youngsters tottering over the black soil on the Withins and on Plex too, lusted after by Grey Herons and Carrion Crows. While the 1995 White Crowned Sparrow at Seaforth (fond memories) may not have been as bright as the stunner down at Woolston Eyes today, it did mean I didn’t have to scoot over the Thelwall Viaduct (I hope everyone who went caught up with the Yankee humbug-head, thanks to all who contacted me about it), so I could spend a few hours out on the mosses. Wheatears and White Wags out on the ploughed fields, with a steady, but light, stream of Swallows banging north, all low to the ground – hardly surprising in the cold wind. Still only three or four singing Corn Buntings though, and no sign of the feeding flock from a week ago. Haskayne Cutting had Willow Warbler, Whitethroat, Blackcap and Chiffchaff, and the impressive Orange-Tip population was finally starting to stir. 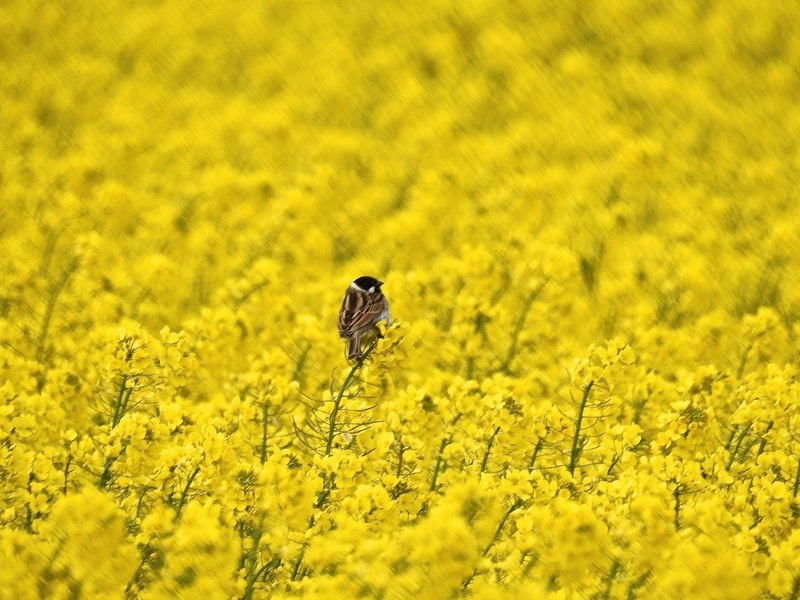 Otherwise it’s all going a bit yellow out there – what with Cowslips flowering and Reed Buntings darting about the rapeseed oil. 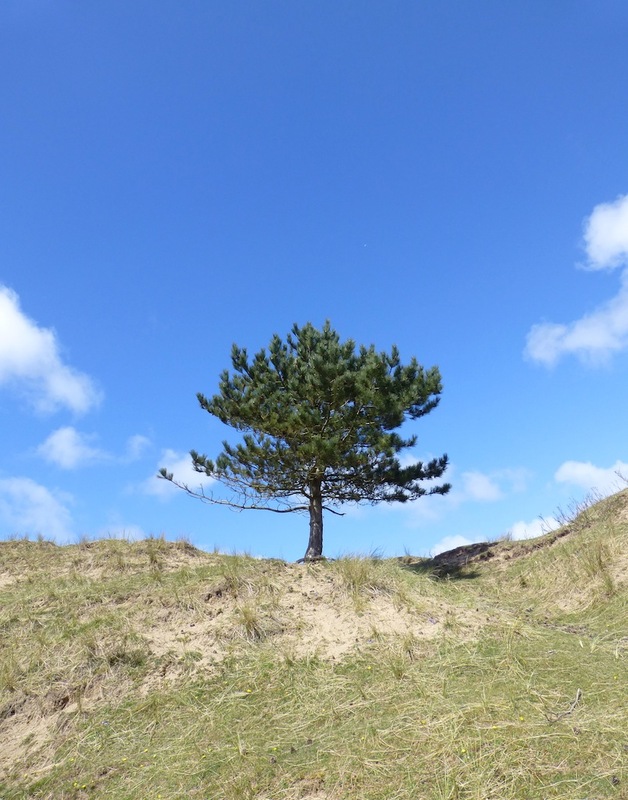 Could watch these things all day long – despite the cold wind, the sun meant sheltered corners of the dune landscape at Ainsdale were still worth checking today – especially as Chris Tynan had seen a Cuckoo south of Shore Road in the morning (see comment on the previous blog entry). I headed south from the office at lunchtime, past reeling Groppers (two within earshot of Ainsdale Discovery Centre still) and at least seven singing Whitethroats. Despite the strong north westerly one even tried a display flight…very well played old chap. 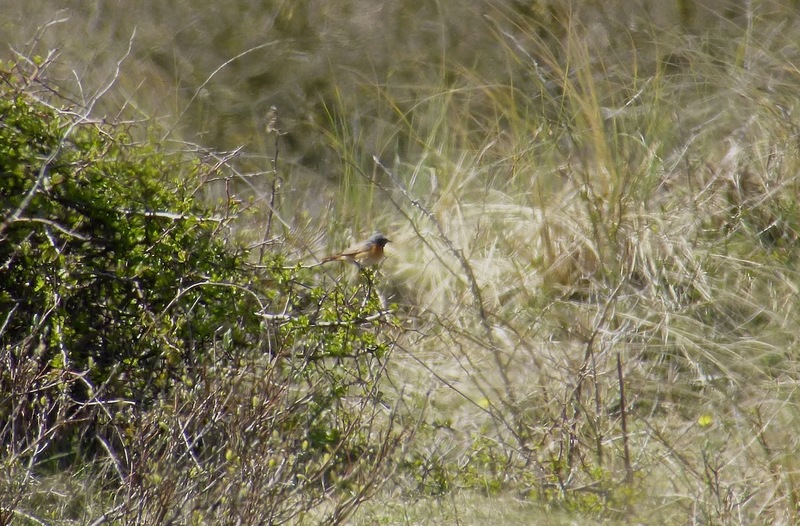 A male Whinchat was the cat’s pyjamas though – I love these things (who doesn’t?). One of two today, it did the decent thing and stayed put long enough for me digiscope as the branches swayed drunkenly around it. 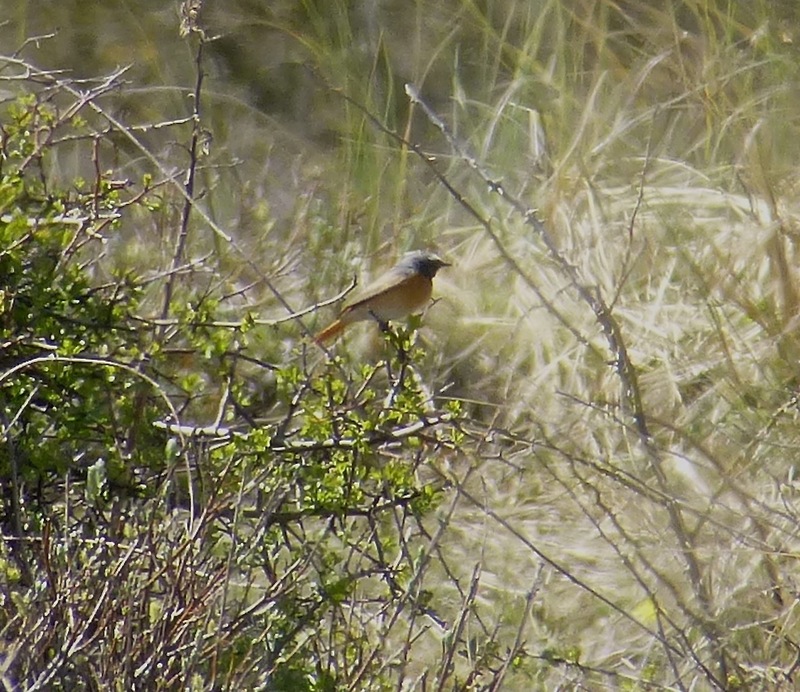 “Not many birds better than a male Whinchat”, I mused as I lifted my bins to a movement at the bottom of a stunted hawthorn and was confronted by a stonking male Redstart! 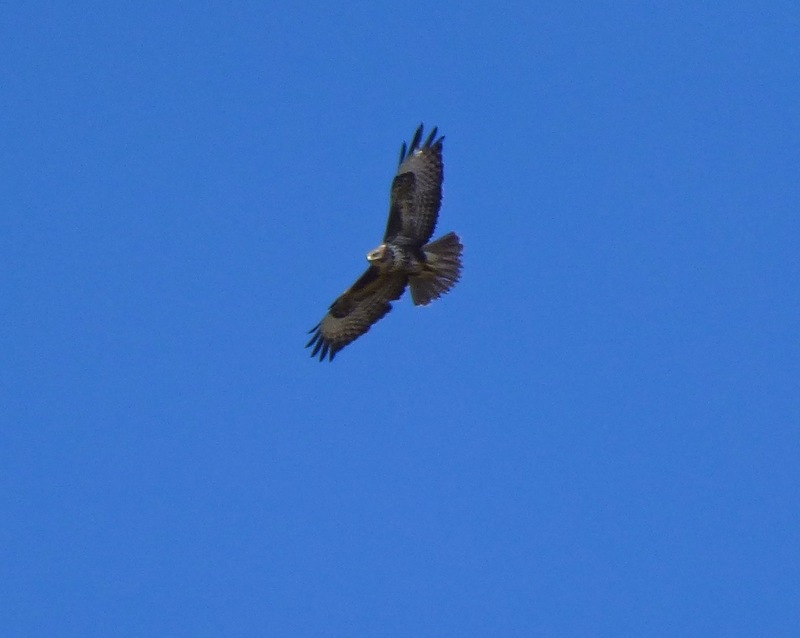 Big smiley face, as a local pair of Buzzards circled overhead and the gull colony on the NNR rose squawking in the breeze. 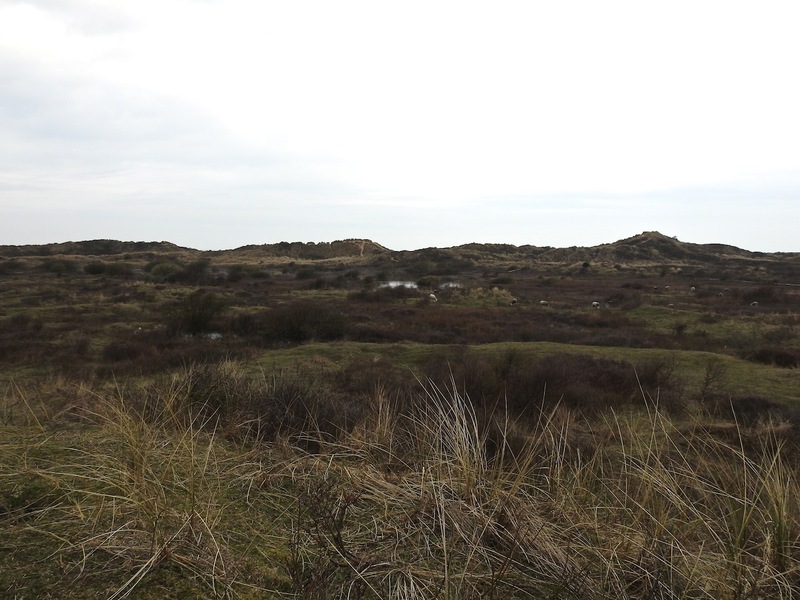 Credit really must go to the best Herdwick Sheep this side of Wasdale Head and the groovy Red Poll coos that have been grazing the dunes this winter – the habitat just looks brilliant this year thanks to them, and the spring migrants seem to like it too. 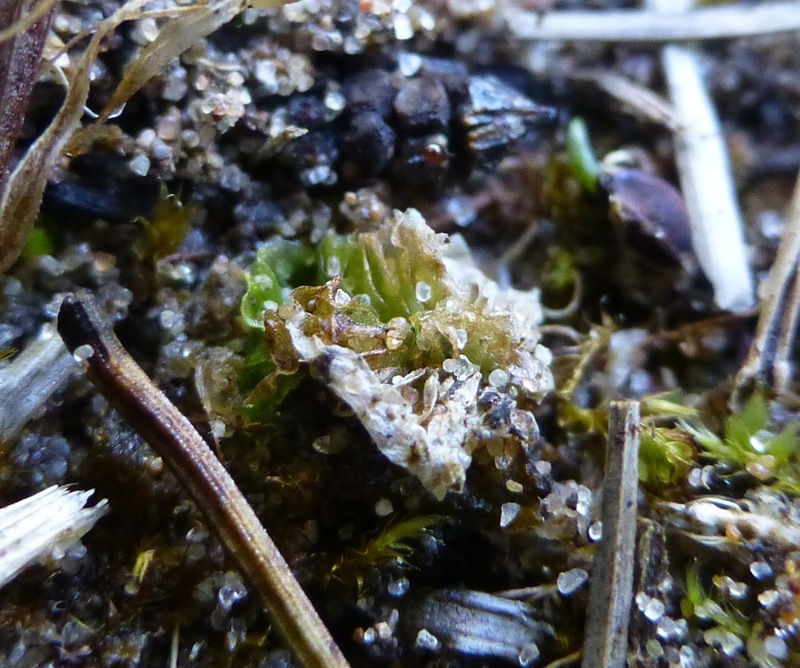 Back at the office I had to lead a brief Petalwort hunt in the pm, and in spite of it being a bit late in the season, managed to find one rather manky specimen at a regular site. Spring Pea, Early Forget Me Not, Heath Dog Violet and Mouse Ear all flowering too, with Speckled Woods out around Sands Lake, Willow Warblers, Chiffies, Blackcaps etc. Let me be absolutely clear; I have been warmer on the tundra and snow-dusted fjells above Varangerfjord than I was at Marshside this morning. 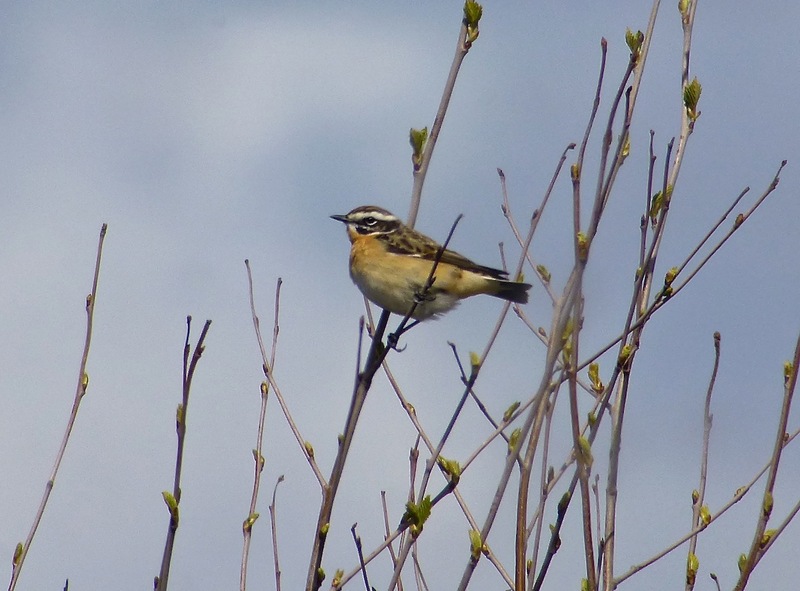 It was sodding freezing – all you could feel for summer migrants arriving today was abject pity. An early doors look at Marshside One before picking up Bazzo wasn’t promising – loads of hirundines, the pair of Scaup and two Whimbrel sure, but it was bleak, bleak, bleak. Back on the platform at Hesketh Road just after 9am we ‘scoped the place with Duncan “Skip” Rothwell, Pete Allen and Alan Wright. I picked up what I thought was a falcon or Sprawk coming in from the right high, but in my bins it became a Cuckoo, which sailed past us all before swinging round and heading off inland over the SSSI ditch. I couldn’t resist the award-winning shot above as we see them so rarely these days. 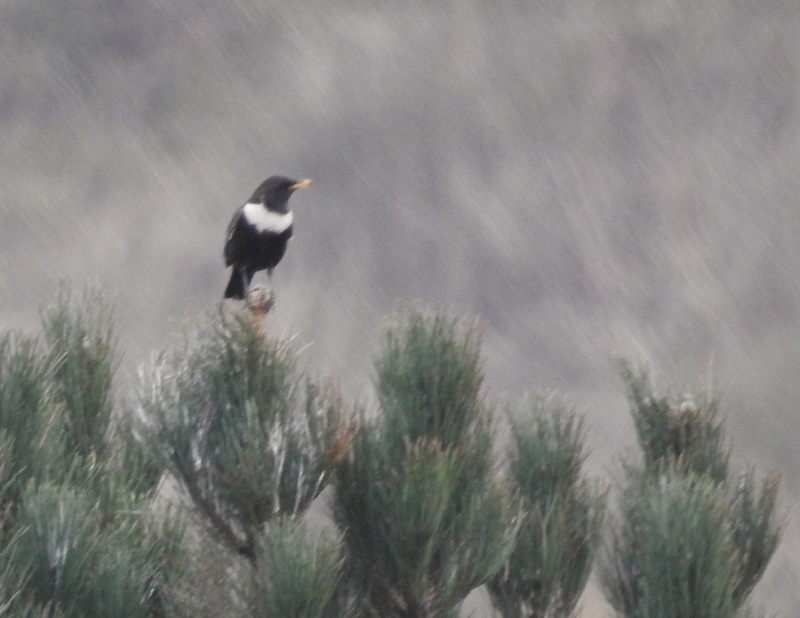 I expect that picture will be gracing wildlife calendars for years to come, but any Cuckoo, even a silent (distant and extremely blurred) one is just dandy. The golf course and SSSI had Sedge, Reed, and Willow Warbler, two singing Goldcrest, 4+ Blackcap and Chiffchaff, with plenty of hirundines forced low by the cloud and icy air, plus my first Swifts of the year, arcing around against the grey. Had five in all this morning. 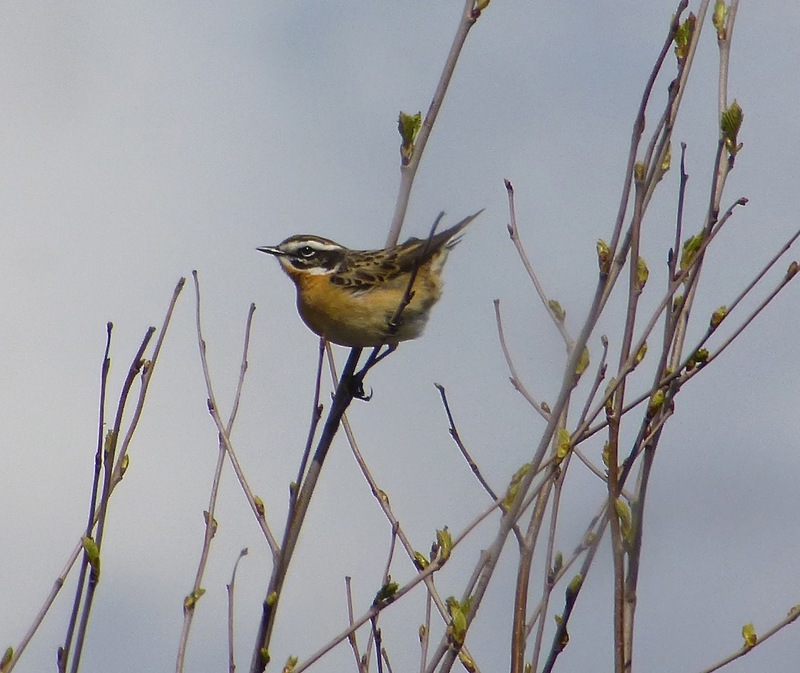 Another Whimbrel went over calling, Redpoll buzzed through and there were at least three singing Whitethroats on Hesketh Road, although all were keeping their heads down. Bazzo and I had a look over the outer marsh, which bizarrely still boasted a heat haze despite the Baltic temperatures, and watched as a Mipit collected grasses at our feet. Initially I thought it was gathering nesting material, but I suddenly realised it was trying to pull the strands together to fashion a rudimentary duvet. Even the remaining Pink Feet looked cold. Small flocks of summer plumage Dunlin (25+ birds) and Ringed Plover on Marshside One, alongside the Avocets, Blackwits, Lapwings and wildfowl. Water levels are dropping now, making the place look tastier than ever. 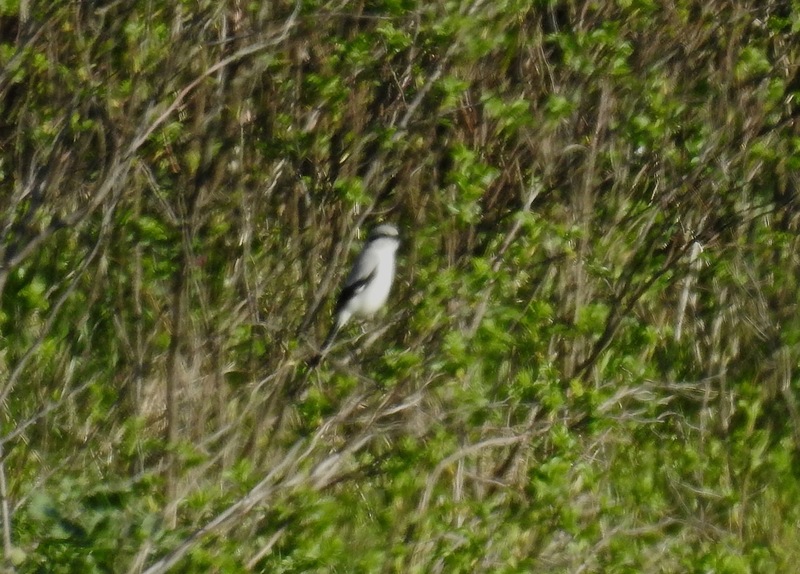 About 15 White Wags at the back of Marshside Two. 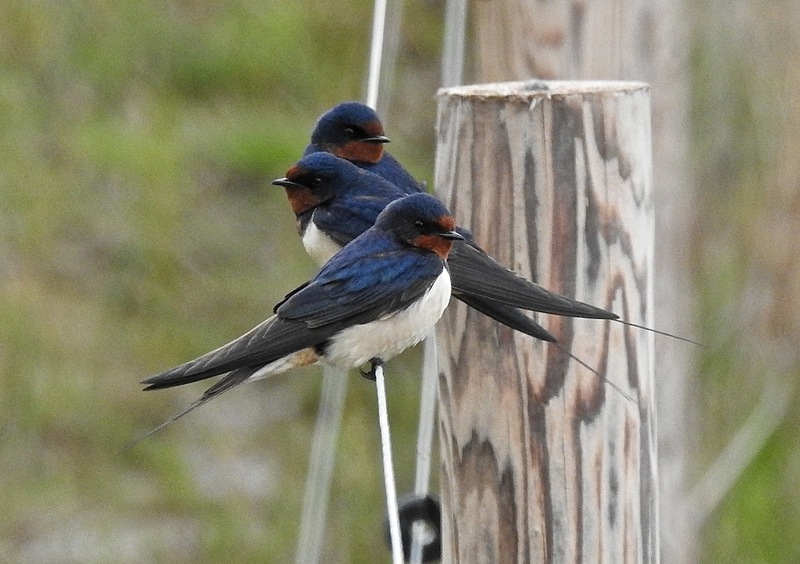 Sandgrounders echoed to the BHG din, while the Swallows there looked particularly miserable. 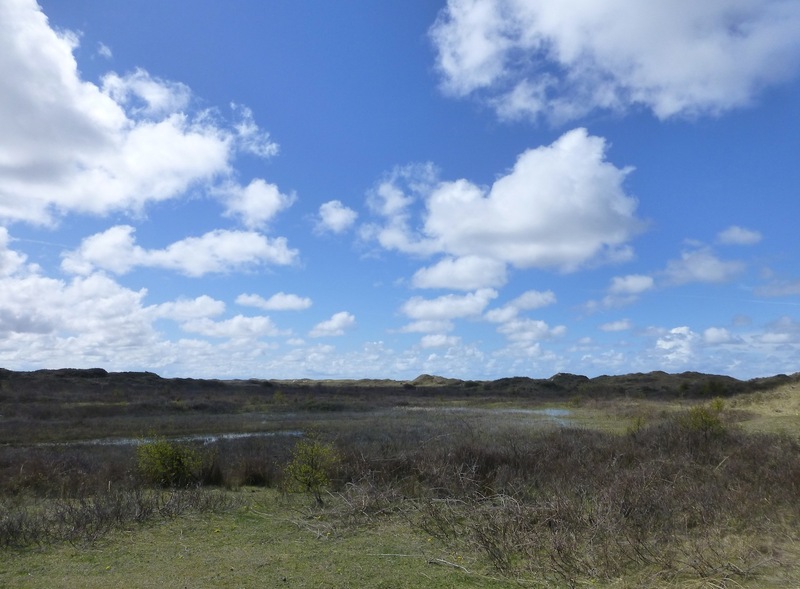 I was out with the Sanderlings Club at Ainsdale this morning (once a month, we take out a rabble of 8-12 year olds who run amok in the dunes and on the beach, poke things with sticks, startle Northern Dune Tiger Beetles, and traumatise St Mark’s Flies, all in the name of fun and education – it’s a blast), so after a lie down in a darkened room for an hour at lunchtime, I decided to make the most of the blue skies and get out in the LNR again for the afternoon. The bitingly cold wind continued to mock the sun, but it was quiet enough south of Shore Road, and while the daytrippers descended on the beach I wandered down to the sheep enclosure. The Gropper was reeling away this morning in the Sea Buckthorn by Ainsdale Discovery Centre, and it was still going strong at 3pm. 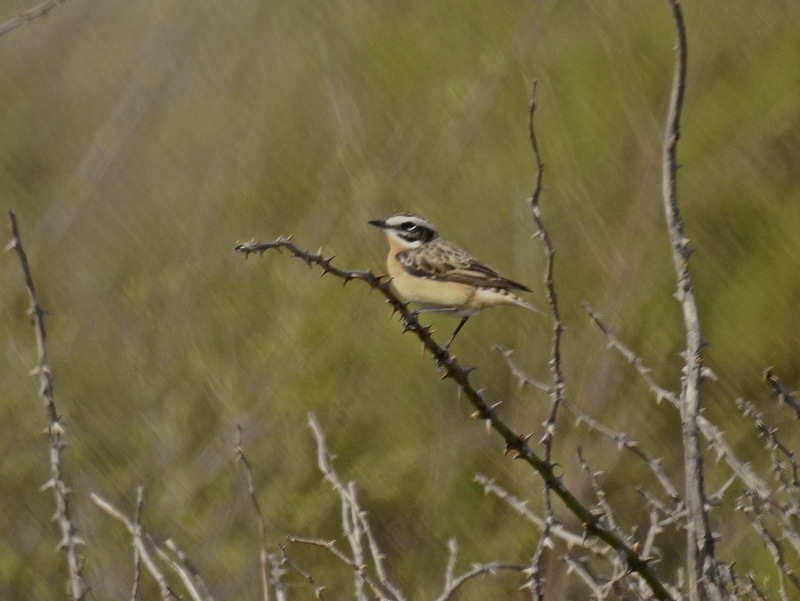 Mipits, Willow Warblers and Chiffies singing as I followed the dune path south and in the enclosure, a fine male Whinchat popped up to take the edge off the wind. 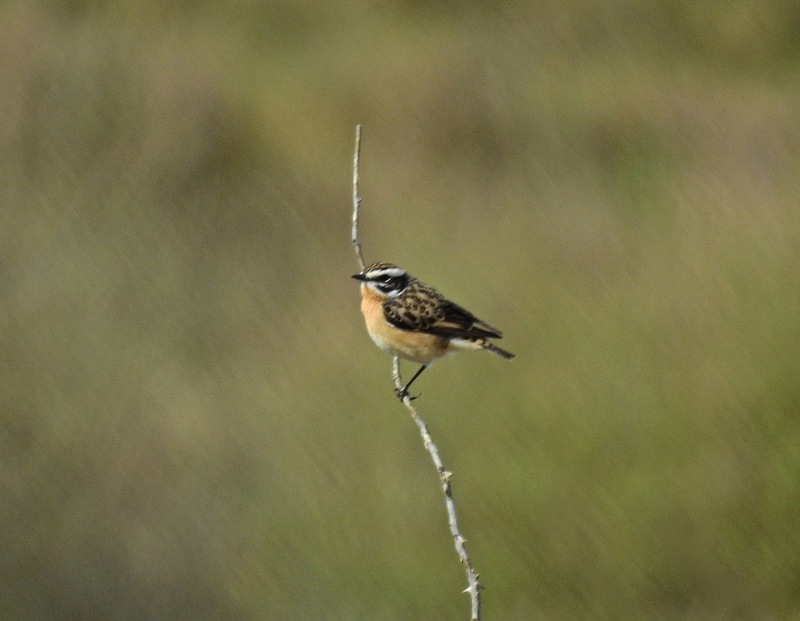 I settled down on the cropped turf on a low sheltered slope and watched the Whinchat for an hour…and relax. The bird frequently zipped down to grab invertebrates in between long periods of showing off on exposed perches, encouraging me to take hundreds of blurry pictures. It came quite close a few times – you’d have thought I’d get a least one picture in focus. 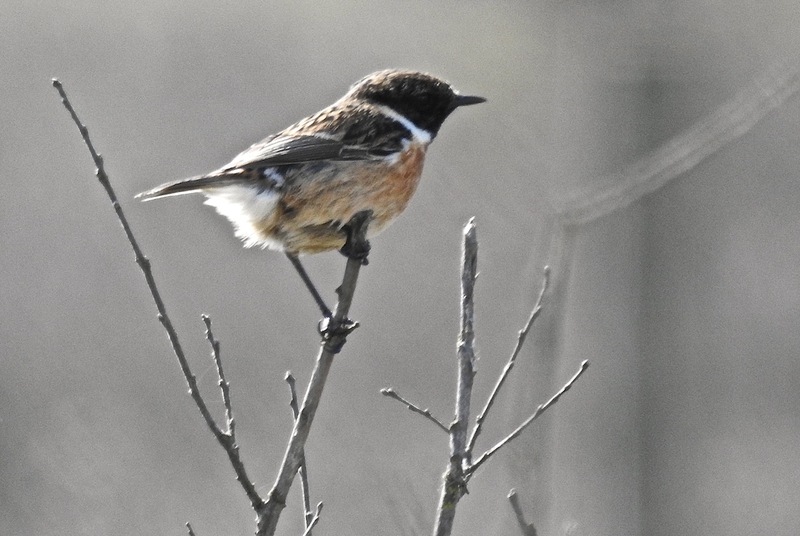 Stonechat in the enclosure still too – they seem to be doing well on the coast this year. I walked back to the car late afternoon and on the spur of the moment squeezed in a quick trip onto Plex (I know, I know…), where a feeding flock of 31 Corn Buntings were on good form and the ongoing spring panic attack continued for the Lapwings. Great to see Bazzo back in the field and leaving Lesser Whitethroat, Garden Warbler, Whinchat and Hobby in his wake at Marshside today (see comments on the previous entry) and his success prompted me to head out after work. It was cloudier and cooler by the afternoon though. Like a sucker, I decided to give the mosses a crack, as it’s addiction time again and if I don’t check the soil as often as possible, the anxiety kicks in. Dotterels in North Wales, Dotterels on Pendle – gotta be worth checking Plex, but as usual I came up empty, although Stock Doves and a few male Wheatears seemed happy enough. I was tallying up a few days back, and I think I’ve managed to self-find a total of 33 Dotterels on the mosses over the years (including two large flocks), but it has been a long time since I’ve stumbled across any now, and with the wind-blown top soil forming a gritty film on the inside of the car and on my optics, I pondered if this would be a good year to try and break the addiction. 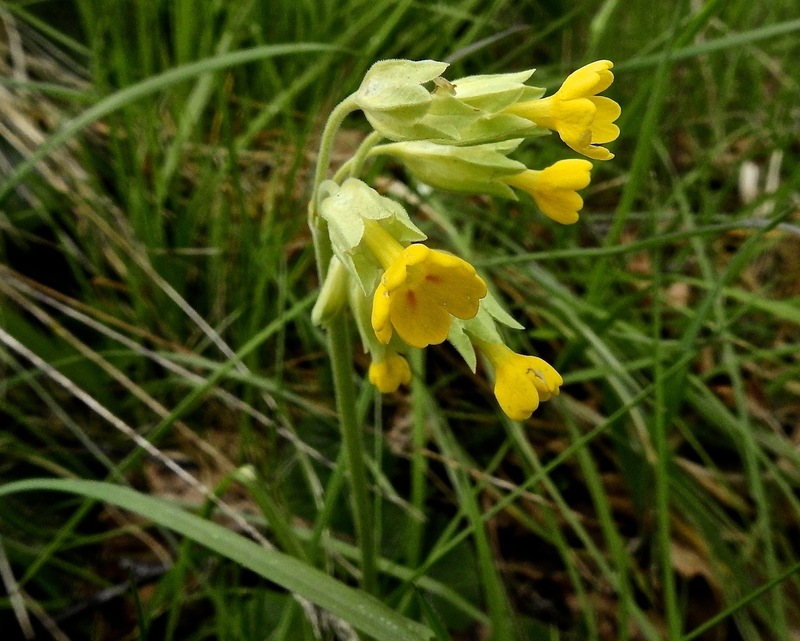 Haskayne Cutting had singing Chiffchaff, Blackcap and Yellowhammer, flowering Cuckoo Flower and enough Mares’ Tails poking up to suggest Orange-Tip time can’t be that far away. Two Jays flopped out of the Cutting as I arrived. 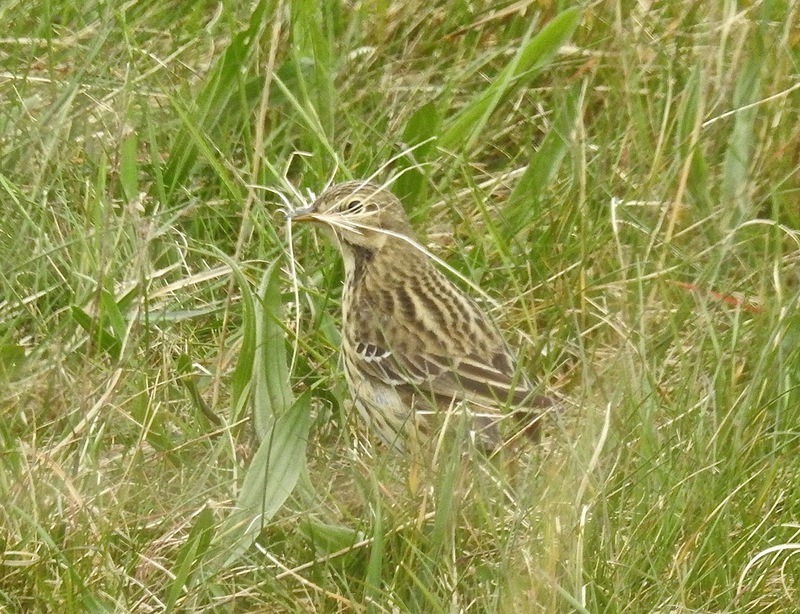 14 Corn Buntings, singing Skylark, White Wags and Swallows back around farmyard nesting sites… sigh…but no Dotterel today. The lunch is on David. 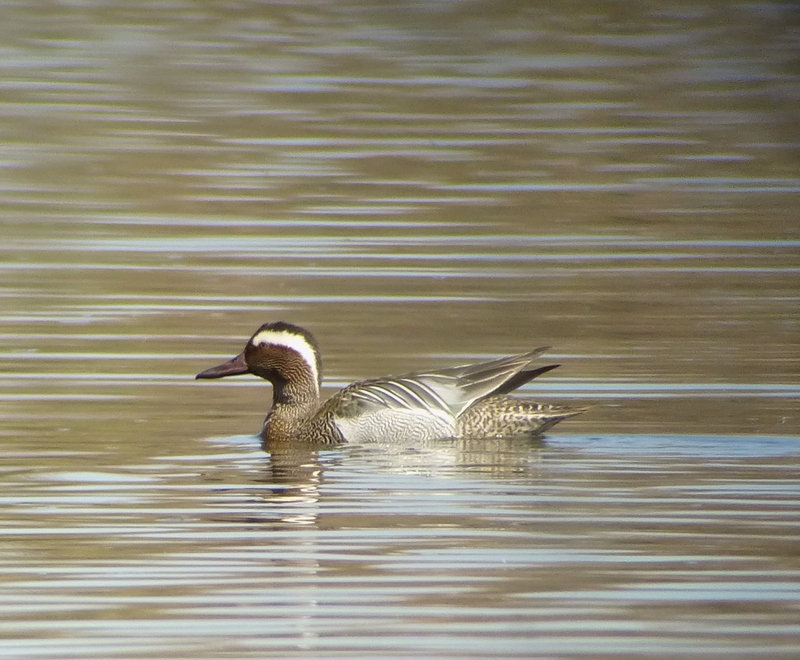 Lovely spring find by David Tyler today, this drake Garganey was on Sands Lake, Ainsdale, and not backward about coming forward in the warm sun at lunchtime, as Willow Warblers and Chiffies sang above him. Great to see one nice and close in such mellow conditions – all power to you, David! He seemed to prefer the south west corner, but sailed all around the island, getting the odd bit of hassle from the resident Gadwall (the Garganey that is, not Big Hairy Dave). 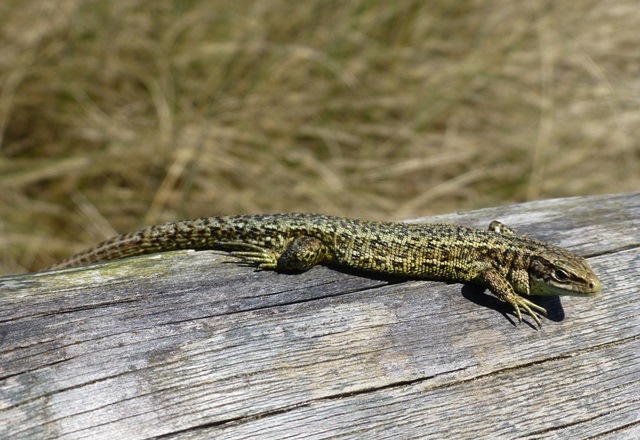 It was warm enough to get the Common Lizards out basking on the coast today too, as Swallows and Sand Martins tore north – not too many House Martins yet though. 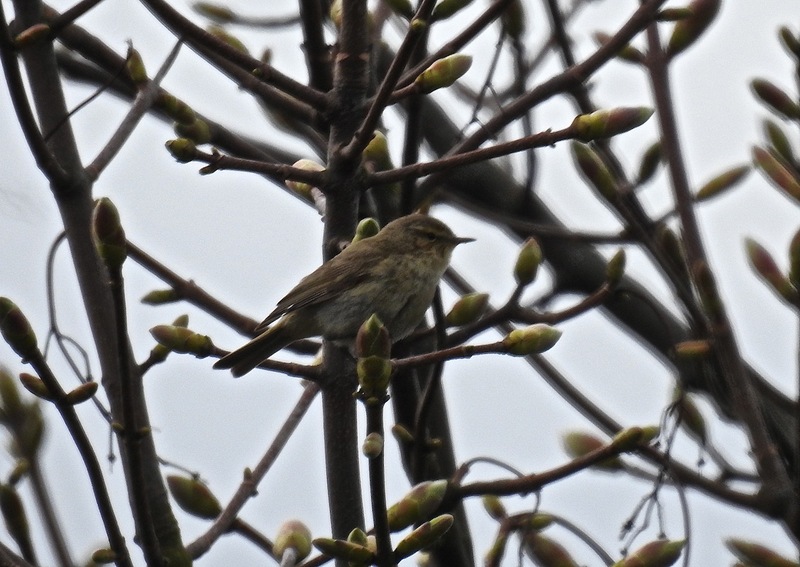 Grasshopper Warbler reeling by Ainsdale Discovery Centre at 0830 and 1500. Still snooty. Still sneaky. Still ‘ere. 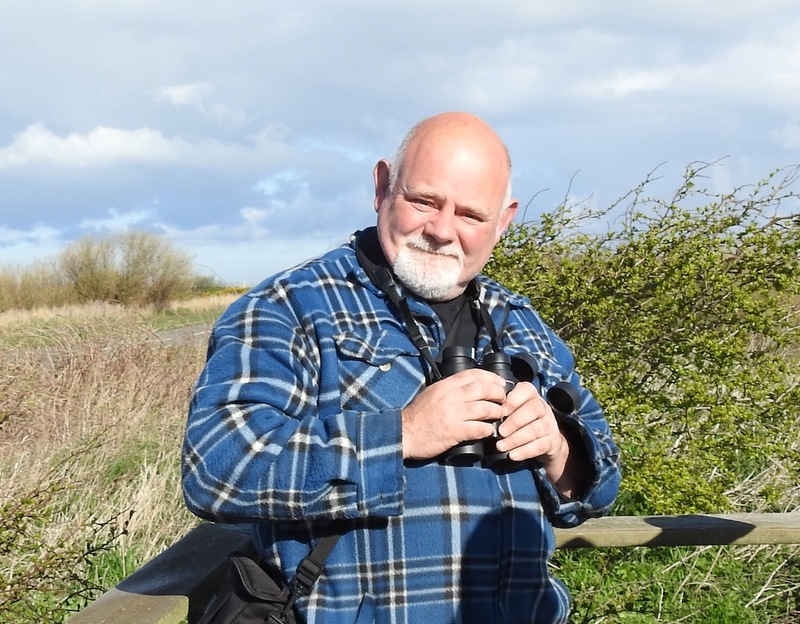 Got my “Gordon White Rouzel Alarm” at 1215 today, after he’d seen a male in the sheep enclosure in Ainsdale LNR, south of Shore Road, while doing the rounds again this morning. 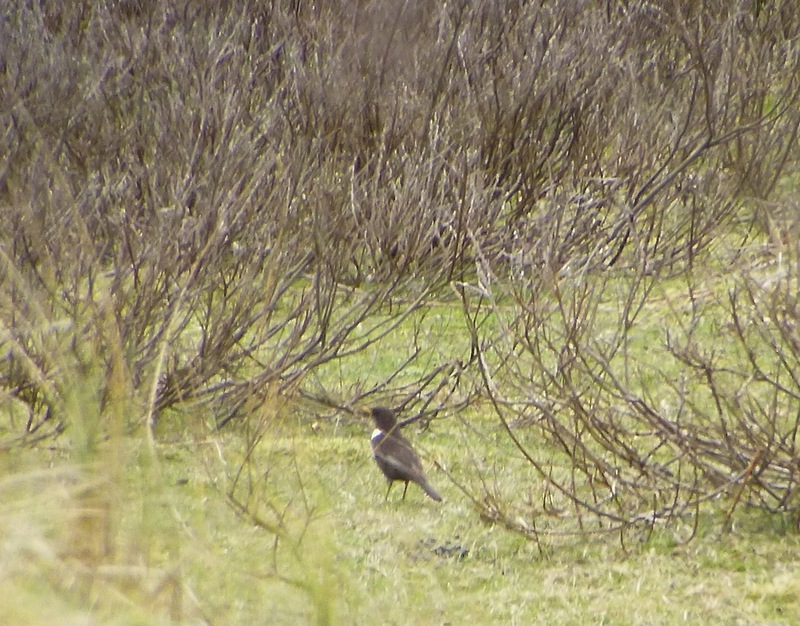 I headed down there during my lunchbreak to receive an object lesson in fieldcraft from the snootiest and wariest Ring Ouzel in the neighbourhood. Knowing how skittish they are, I crawled up the steep blind side of the highest dune in the sheep enclosure, through the dried rabbit, sheep and cow poop (don’t tell Mrs D, these work troos were clean on this morning). There is a small bowl at the top of the dune, and I figured I could slither in on my belly like an overweight, myopic middle-aged ninja, and survey most of the enclosure unseen, with some shelter from the blustery wind. Turns out the Rouzel had pretty much the same idea – as I hauled myself over the lip of the bowl on my belly, there it was, about 6 inches from my nose….it cackled loudly at my ineptitude and powered over the ridge of the dune and out of sight. Lovely, if brief point blank view!! 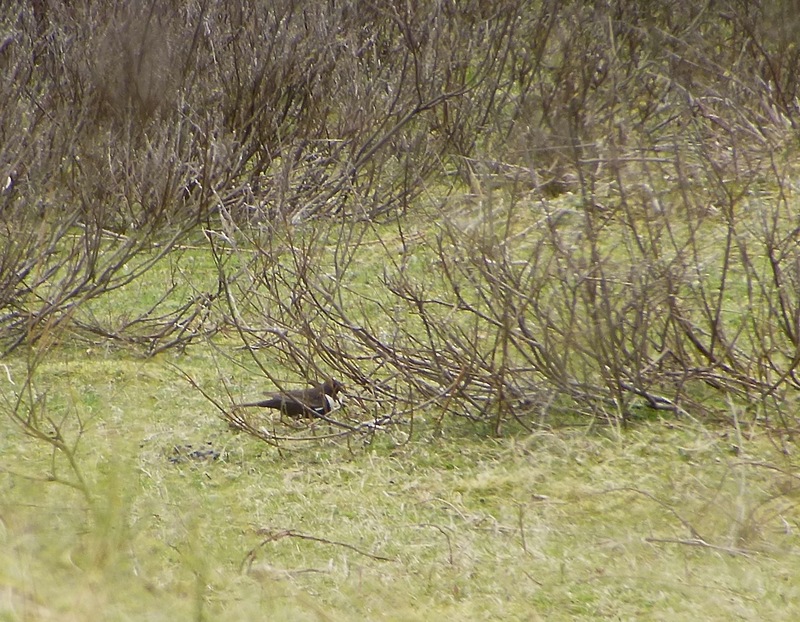 1-0 to the Ring Ouzel. It took 20 minutes of crawling and edging around the side of the dune, avoiding breaking the skyline, before I spotted it again, feeding amongst the Creeping Willow and cropped turf. I managed to fire off two or three digiscoped blurs before it was spooked by two passing Jackdaws, saw me and flew off to a nearby pine to glare snootily for a minute or so. Then it dropped out of sight, and that was it, my Monday lunch session with Mr Snooty Fox over, and I had been completely outwitted by the haughtiest thrush on the block. Again. Crisp frosty morning, clear blue skies, Willow Warblers and Chiffies singing – all very nice, but the path between Hesketh Rd and Marshside Rd was hard going at 8am, with a Wheatear, a few hirundines, and Siskins and Redpolls over, and Blackcap, Willow Warbler and Chiffchaff singing away on the golf course. Two Jays moved south, and Buzzard and Sprawk were up, but it felt quiet. 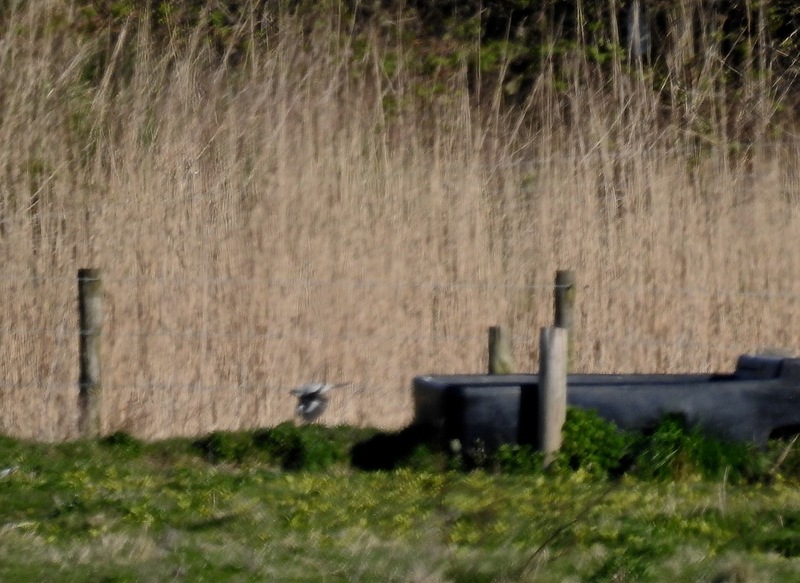 Shows what I know – got to the Hesketh Rd platform where I found Graham Clarkson (there he is look, with another Marshside mega in his troosers) and the Jons/Johns happily watching a Great Grey Shrike in the bushes on the west side of Marshside One. Shrike-magnet Clarkson seems to attract members of this family, with Woodchat and Great Grey already under his “Marshside found” belt, before this morning’s score – thanks Graham. 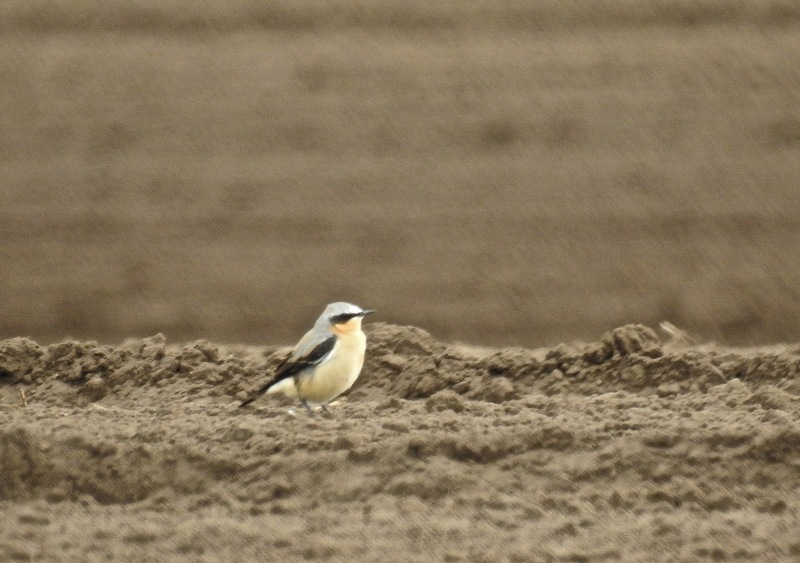 Initially the bird was distant, hunting and perching up along the bank down into Wheatear Corner, a white blob in the morning sun, but later it crossed Hesketh Rd and gave up the coy business to perch right in front of the growing crowds on the Municipal Golf Course (first shrikey pic above), as Mipits mobbed it, before swooping into the scrub on the seaward bank. 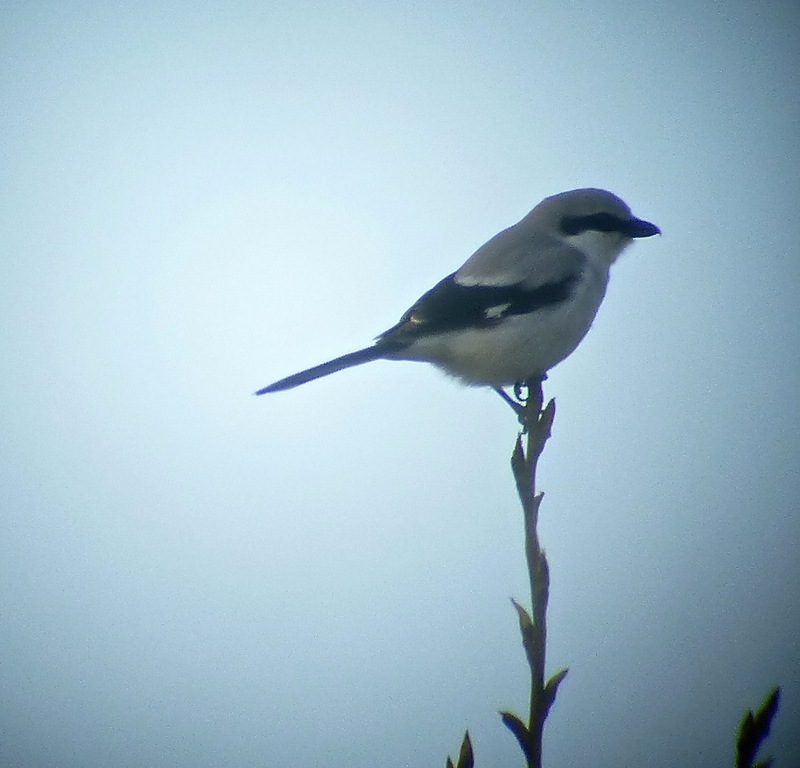 Finally got Great Grey Shrike on me Marshside list (third record according to “Mr Marshside” Bazzo McCarthy – good to see you out again buddy) – yippee! With a quiet morning transformed, I carried on birding, but it was all a bit of an anti-climax after the shrikey stuff. 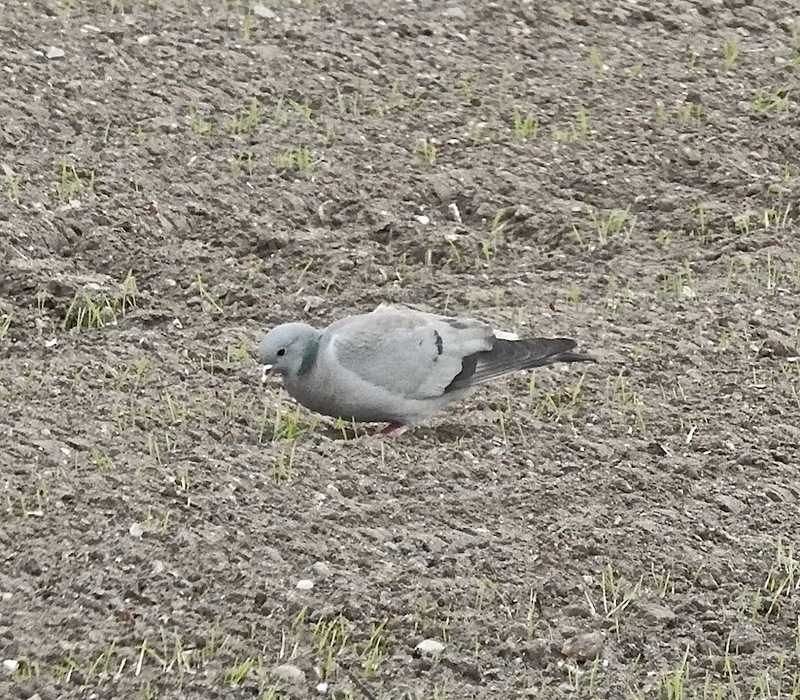 The Scaup were still off the Hesketh Road platform, a few Small Tortoiseshells were on the wing and at least three Med Gulls were in front of Sandgrounders, where a White Wag dropped in briefly, before I drove home under a Simpsons sky for an afternoon of slash and burn gardening. Early doors Rouzel thrills gave way to a course this morning on information compliance. Actually it was an excellent session, and even I now understand that stashing a pen drive in your undercrackers simply does not constitute “safe data storage” in the eyes of the law. 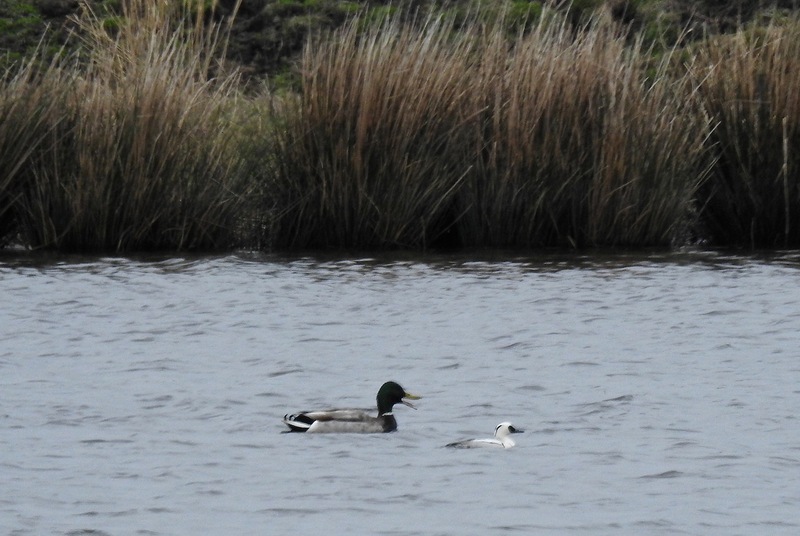 With the grown-up stuff out of the way and a few hours off, I drove down to the always excellent Lunt Meadows for a look at the drake Smew that turned up there yesterday. 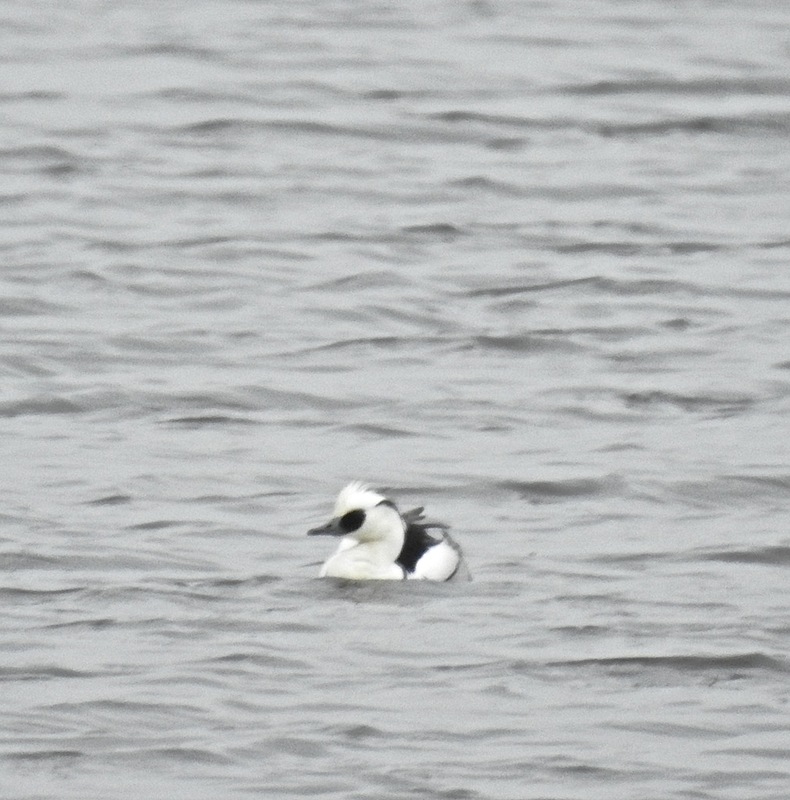 Almost as much fun as watching the Smew “Steamboat Willy-ing” up and down the lagoon, occasionally catching small fish, was bumping into lots of familiar faces – birders were coming from everywhere to hook up with it. 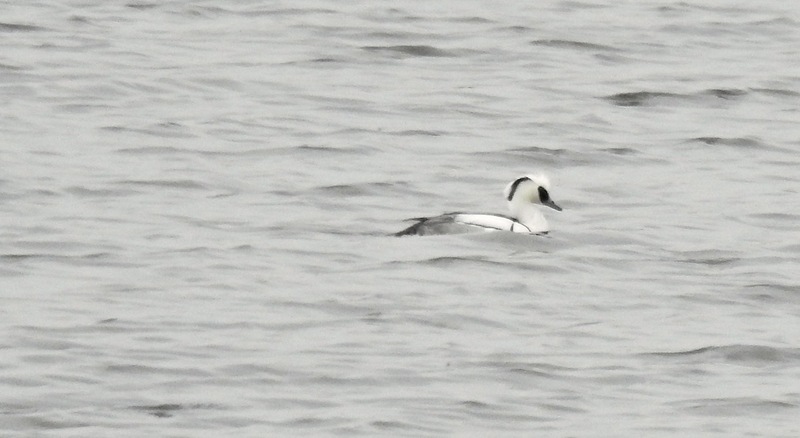 It has been a loooooong time since a drake was get-able in this neck of the woods, so a “Smew twitch” was only to be expected. Singing Reed Warbler (or was it a Percy Sledge?? I should have paid more attention, I was too busy watching the floating ice cream) in the scrub and reeds behind us, Willow Warbler, Chiffy, and at least 100 hirundines overhead in the very cold, grey sky. 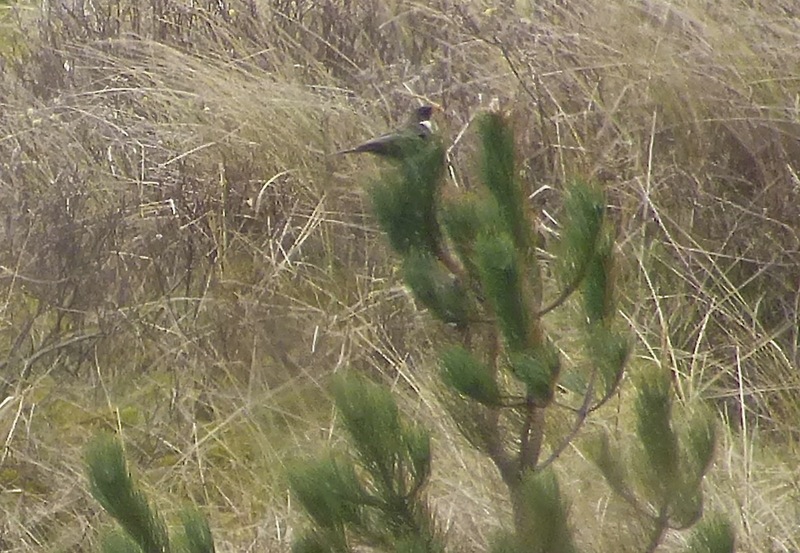 After Lunt, with afternoon rain getting heavier, I rattled over Plex, but in terms of interest, I only managed a single Pink Foot, single Corn Bunt and single Wheatear in that order. I’ve always felt Rouzels to be quite haughty, snooty critters – absolutely marvellous no doubt, but snooty all the same. You just have to examine the best places to look for them on spring passage (unless you fancy hoicking up a Pennine clough/Welsh valley) – they seem to like private golf courses and places called “The Paddocks”, but Google that address round here and the locations that come up certainly don’t look like they’d welcome shabby birders in the shrubbery at first light. And that’s another thing – Ring Ouzels tend to show well early morning, and when they do, they glare down their lemony yellow black-tipped noses at you, before flying off strongly. I tried for the two Gordon White reported in the sheep enclosure south of Shore Road in the Ainsdale LNR yesterday, but it was mid-morning and there was no sign, so I reset the alarm and shambled down there at dawn today. Once on the high ground at the east end of the enclosure I quickly picked out one bright male sneaking about the Creeping Willow before it flew up to the top of a pine, while another was lurking in the willow scrub. Superb to catch up with the snooty foxes again – thanks for the tip off Gordon! 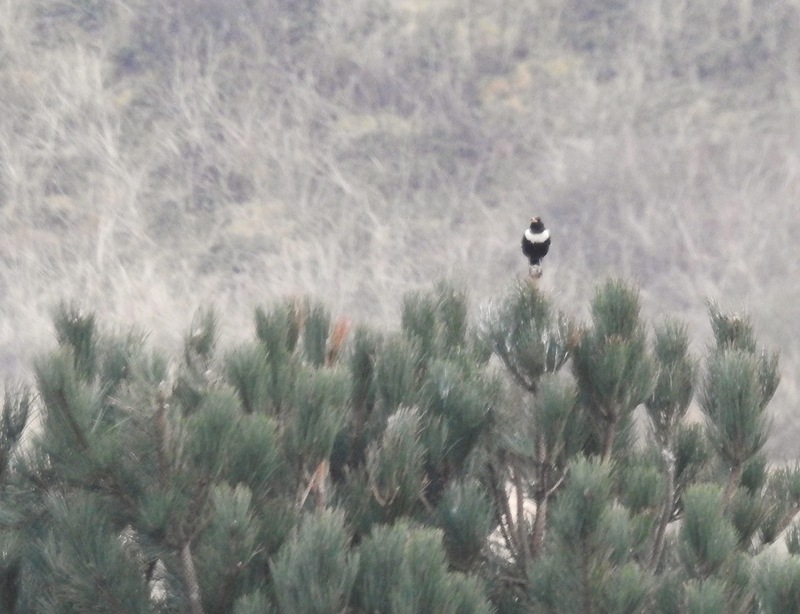 Watched the birds (both males) for about 25 minutes before they flew into the NNR grazing area and out of view. If you do go looking for these crackers, please remember sheep are still grazing on site (even if the supersexy Red Poll cattle have left for their summer hols), so close gates behind you and keep dogs on a lead in the sheep enclosures. The grazing activities of the livestock are what’s making the site so attractive to Rouzels in the first place, so showing them a bit of respect is the least we can do – and the Herdwick Sheeps have such a lovely smile after all. Plenty of Willow Warblers singing in there this morning, Chiffchaffs, Redpoll, Stonechat, hirundines whizzing north and my second reeling Gropper of the spring….not a bad haul before clocking on.